I am such a lousy mum! After a great lunch date with Ayra in Oct 2014, I haven’t been able to do another one for almost a year. I promised myself that I need to do it more often, but work and appointments took over almost every available lunch hours over the past year and more in the coming months. But still, its better to have a once-a-blue-moon opportunity than to never have any. So when we had a chance to go out on a mother-elder-daughter only date few weeks ago, we pampered ourselves a little with a nice slow lunch. No rushing, no feeding just good yummilicious lunch with my girl. See that face when she truffle fries was served? Never mind its not that healthy, that smile and giggle makes all worries go away. Just eat and enjoy! 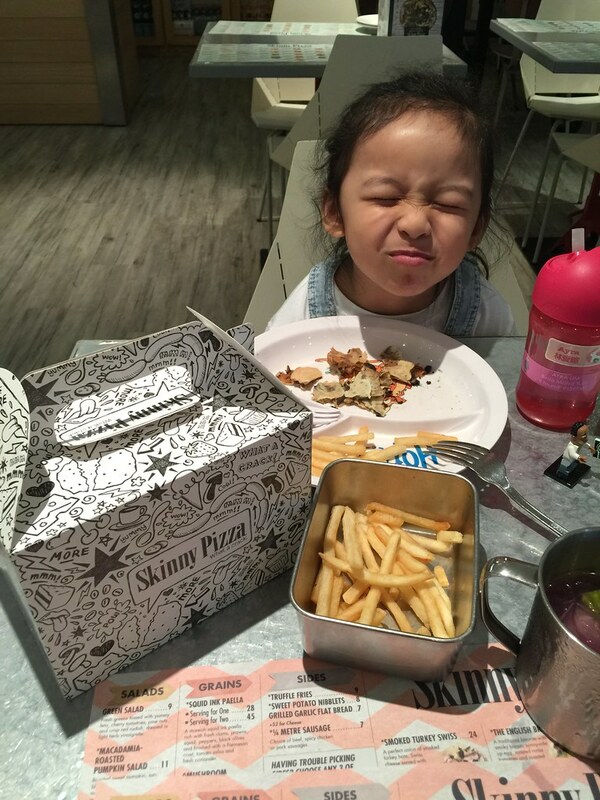 Lunch that day was at Skinny Pizza, because she requested for fries and then later pizza. I could only think of one place where I can enjoy pizza with her without having to feel that guilty since I was supposed to be avoiding eating processed carb then. 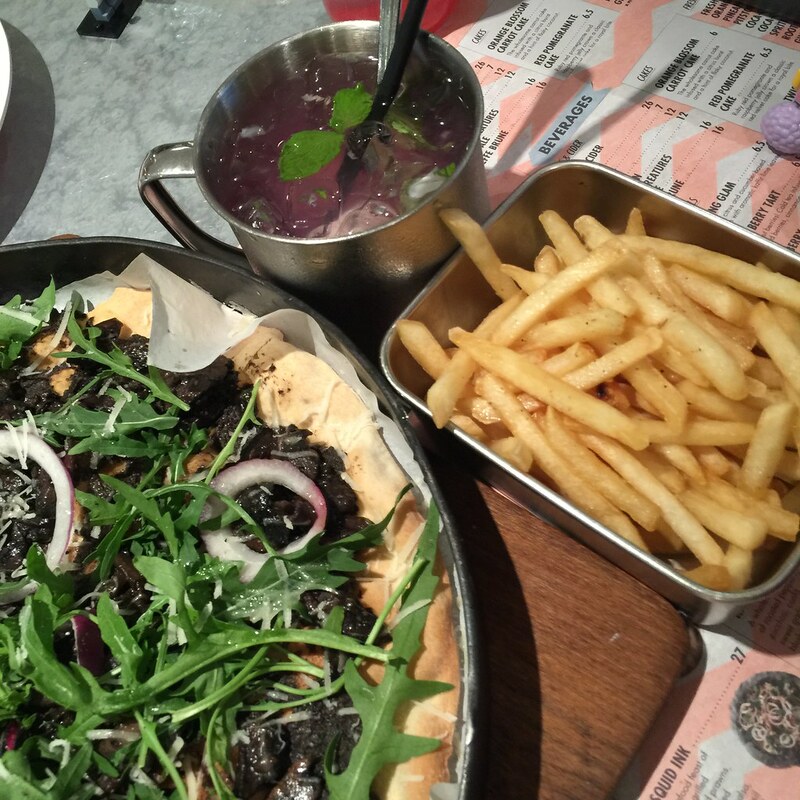 We ordered a Wild Truffled Mushroom, truffle fries and ice cold drink for me. Can you tell I had a bad craving for truffles that day? LOL! 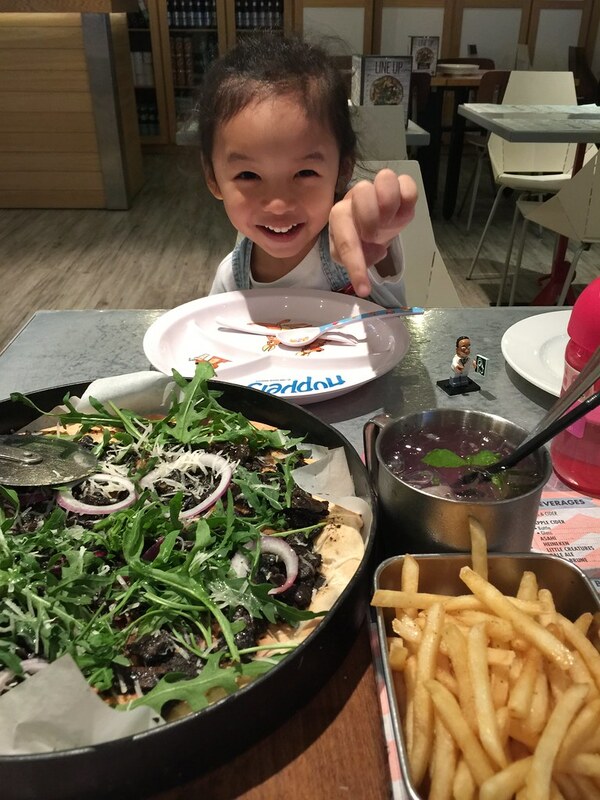 Ayra enjoyed the crispy thin pizza crust and fries, while I had lots of wild truffled mushroom and rocket leaves. Of course we couldn’t finish the entire pizza so we requested them to pack the left over for us. But the silly mummy left the box of pizza in the ladies and totally forgot about it! Only realized our pizza was missing in the evening when we were on our way home. Too excited about the day’s activities and little things like this are easily forgotten. Hope we can do more of such girly date out and not just that once a year! I love seeing her so happy. If grown-up Arya would look back five years from now, I’m sure this will be one of the most unforgettable experiences she’s had with you. It’s been seven years and what my daughter and I shared were fast food / kopitiam / hawker- everything rushed date. I hope to have an experience like this with her too, the slow and enjoyable one. Thank you for this reminder. Mmmmm truffle fries!! Haven’t had that in ages! 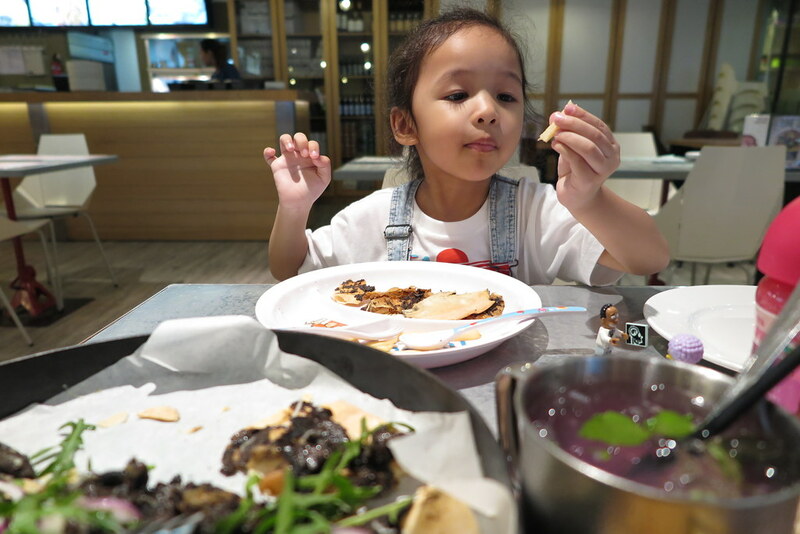 It’s nice to enjoy a long relaxing meals with our kids once in a while.. sometimes I really feel so bad when I’ve to rush Lil Pumpkin to eat and finish her food fast! I’m sure she is appreciative of you taking that long lunch with her. Her smiles reaffirm that… So no, u aren’t a lousy mum. 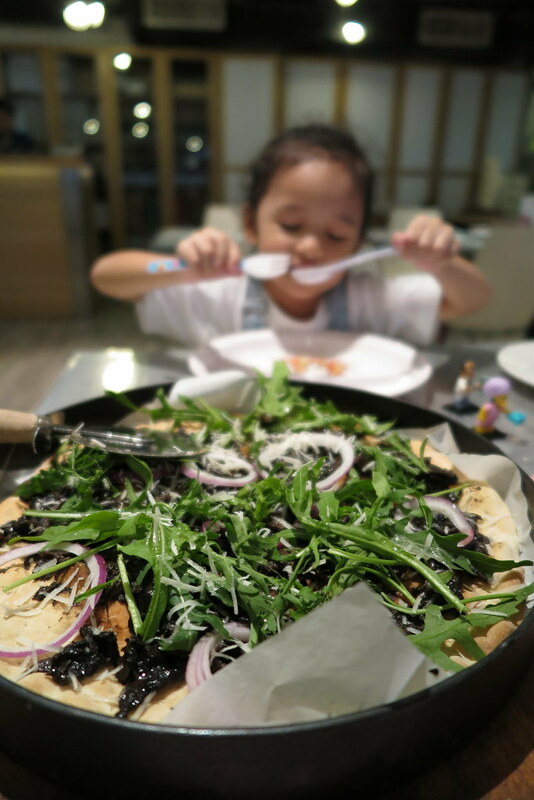 Pizza is such a great way to convince kids to eat vegetables – as evidenced by that huge mound of rocket that your little girl consumed! 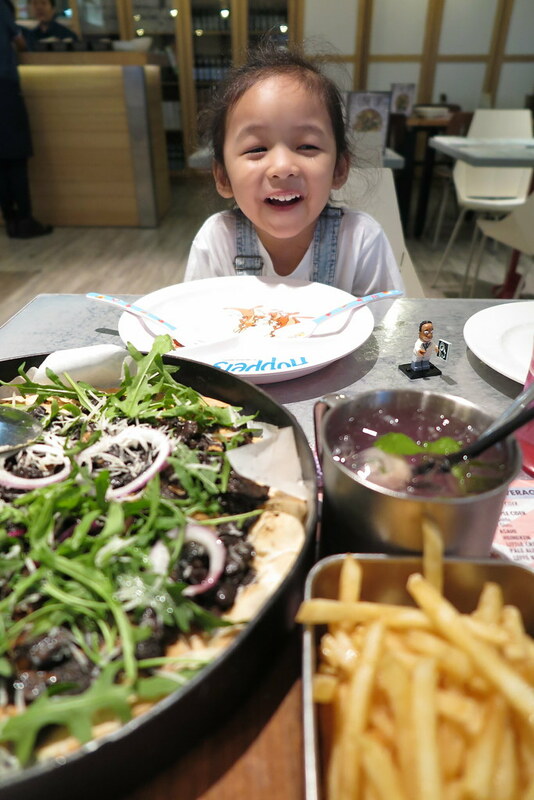 Unfortunately for me, my son considers rocket a ‘spicy vegetable’ because of it’s peppery flavour and won’t be enticed to have it, pizza or no. Looks like a wonderful date! And the food looks awesome! I need some fries now! My last date with my firstborn was a few months ago! Your post reminds me to arrange a date with her soon!